Block Engineering's next generation LaserTune represents a significant leap forward in offering the ultimate mid-IR, pulsed Quantum Cascade Laser (QCL) source to meet the ever challenging requirements of the research community. The fully integrated "single box" concept has been taken to new extremes with a significant reduction in footprint size, saving considerable laboratory bench space. This single box also offers the widest gap-free tuning range available on the market of 5.4 - 12.8 microns. No external power supply or control peripherals are required. Key considerations in the design of the new LaserTune were to provide the end user with the ultimate in flexibility to optimize the source to meet the application requirements. An intuitive user interface has been designed with an onboard touch screen for full setup of all source parameters directly at the device. Additionally, the instrument comes with wireless capability for remote control so it can be programmed via an iPad or other computer peripheral. The software provides the user with the ability to adjust critical laser parameters including thermal control of the QCL, pumping current, pulse parameters and both internal as well as external triggering. The LaserTune can now be programmed to operate in several modes including Move Tune (manual control), Step Tune with programmable steps, and Sweep Tune with programmable sweep parameters. 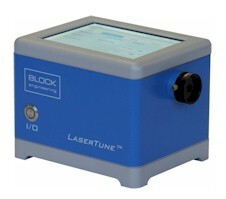 LaserTune offers an extremely fast sweep capability at 25 cm-1 per millisecond. The system supports pulse durations of between 20 to 500 nsec, a repetition rate of up to ~3 MHz, and a duty-cycle of up to 15%. The pulses can be internally triggered at regular intervals with an available sync-out signal. External triggering is also supported. The beam size is roughly 2 mm x 4 mm with industry leading pointing stability. Download a detailed specifications sheet for the LaserTune (PDF). If you would like to discuss how the LaserTune can help with your application needs, please contact us.